Paul’s Place Omelettery is a breakfast spot in the Fairview area of Vancouver that specializes in omelettes and other breakfast items. The inside of the restaurant has a homey, cozy vibe that is the perfect ambiance for a good breakfast. I love eating breakfast meals for lunch, so while I was working in the area I came here to satisfy my craving. The omelette special of the day was made with roasted turkey, bacon, corn, mushrooms, onions, edam, cheddar, and cream cheese. The omelette was well prepared. The eggs were very thin, light, and fluffy. There was also the perfect amount of fillings so that it wasn’t overflowing or bursting open, but it was still a substantial size. I really enjoyed the mixture of fillings in the omelette. I liked that they used roasted turkey because it is something different from the regular bacon options. I also loved the addition of cream cheese. It made everything super rich and creamy and delicious. 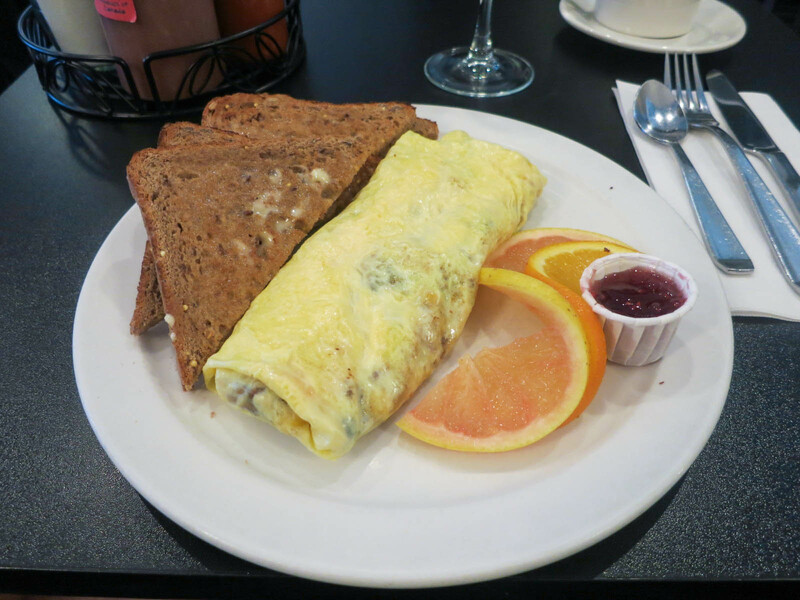 If you ever get a chance to order an omelette filled with cream cheese, do it. The one downside to Paul’s Place is that they don’t serve hash browns with the omelettes (you have to pay extra to add them). To be honest, you probably don’t really need the extra carbs if you are given four slices of toast, but I was a little sad because I prefer hash browns over toast. Paul’s Place Omelettery is a good spot in Vancouver for great omelettes. The food isn’t anything fancy, but it is well prepared and will satisfy a craving for a good classic breakfast. Yes, for a great omelette.